Less than half of American doctors speak another language in addition to English and many of them turn to Google Translate to instruct patients who have a different first language. Communicating instructions like when and how to take medications is essential to patients’ recovery but – especially in emergency departments – there may not always be a physician available and equipped to do so. A new study from the University of California San Francisco (UCSF) found that about 60 percent of discharge instructions made by Google translate were accurate, an encouraging stat for tech-reliant doctors. But four percent were way off – and their inaccuracies could prove dangerous, if not fatal, to patients. Over 20 percent of Americans do not speak English as their first language, and about half of those primarily speak Spanish at home. And Latino men and women in the US are twice as likely as the general American population to go to an emergency room for non-emergencies. Nearly 40 percent of Latinos said they ‘rely’ on the ER, according to consumer healthcare nonprofit FAIRHealth. So the population that looks to the ER for the largest proprotion of their medical needs is also the one that physicians there are less likely to be able to clearly and effectively serve. Americans on the whole and doctors in particular are becoming more multilingual, with 42 percent of doctors in California now reporting that they are fluent in at least one language besides English. But, internationally, 56 percent of medical graduates report speaking other languages, compared to just 37 percent here. Translation AIs, like Google Translate, offer tools to bridge that gap, and while they might be better than nothing, they may also lull doctors and patients into a false sense of security that everyone is on the same page. ‘Google Translate is more accurate than a lot of clinicians believe, and I think it’s definitely more useful than not providing anything at all,’ said first study author Dr Elaine Khoong, a primary care researcher at UCSF. 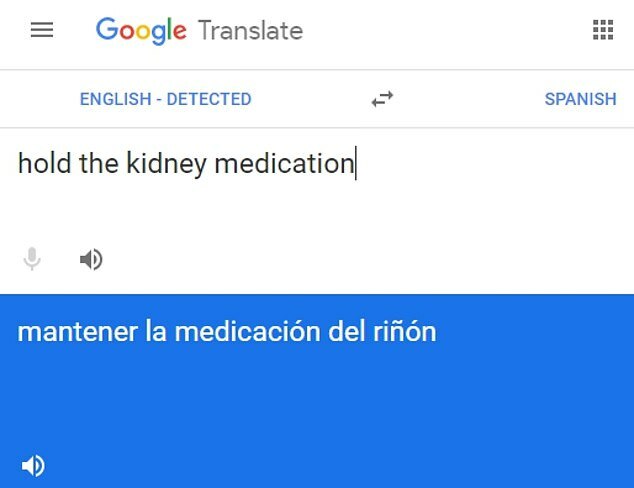 The new UCSF research, published in JAMA Internal Medicine today, revealed just how useful Google’s translation tool is, as well as how dangerous it may be when the AI misses the mark. Dr Khoong and her team analyzed how Google Translate converted instructions from 100 ER discharge papers into either Spanish or Chinese. The app is a bit more adept at Spanish, and was about 92 percent accurate in interpreting English instructions for Spanish speakers. In Chinese, the translations were only about 81 percent accurate. Some of the results the AI spit out were comical, while others were downright scary. Either way, the UCSF team decided these were ‘life threatening’ instructions. The more casually, complexly or jargon-heavily doctors spoke or wrote in English, the more perplexed Google got. ‘It confused the machine because the sentence structure was so complicated,’ Dr Khoong said. The researchers saw that as far from ideal, but not a fatal error. In a perfect world, a tool like Google’s should be used in conjunction with a translator or at least a friend or family member with some second language skills. The researchers suggested instead that maybe doctors should give patients for whom English is a second language an English copy of the discharge order as well as the Google Translated one, so the could ask English speaking friends of family to clarify anything that seemed strange. Still, they gave Google Translate a tepid endorsement: ‘We cautiously support its use,’ the authors wrote.